I did some grocery shopping last weekend, and Fusilli was on the list. I spent 15 minutes reading the boxes in the pasta aisle before I realized they didn’t have it, so I referred to an image search for a descent substitute. 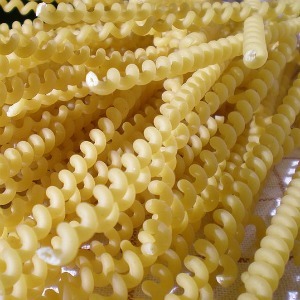 It’s a spiral pasta so rotini would work fine, in fact, any pasta would work fine. It’s pasta. Why do we need so many kinds? 600! 600 shapes. Now, I understand – and enjoy – variety of texture in my food, but every pasta technically tastes the same. The fact that we can say, “I’m feeling like Penne instead of Ziti tonight,” makes me feel like we’re a bunch of youngins, unable to eat our grilled cheese sandwiches because Mom hasn’t cut them into tiny little triangles. Cutting it doesn’t change the taste lil’ guy. Are there any other foods where they reshape the exact same ingredients and sell them under different names? Let me know in the comments. I’d google that myself, but I’m not sure how.